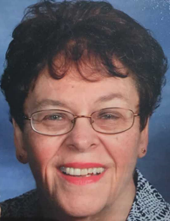 Kathleen Frances Ostrowski, 77, of Menasha WI, Formally of Menomonee Falls WI. , passed away Sunday June 10th, at Theda Care Medical Center Hospital, in Appleton. Kathleen was born in Wausau, WI on July 8th, 1940 to Louie and Mary (Bruski) Stankowski. She was the oldest of 4 siblings who helped her parents run a family tavern business in Bevent and Northland WI. She was a graduate of Rosholt High School class of 1958. Kathleen married the love of her life Dennis Ostrowski on August 5, 1961 in Rosholt at St. Adalbert’s Church. She worked as a secretary for the Milwaukee Journal Sentinel and JC Penny until adopting both of her children, and becoming a loving mother full-time. Kathleen spent most of her life living and making a home for over 50 years in the Menomonee Falls area before having moved recently to Menasha, WI. Her hobbies included, decorating every inch of her house for the holidays, traveling, casino adventures, bowling, preserving and canning the produce from her garden. She also enjoyed fishing, camping, cooking, and cross stitch. She always looked forward to gathering with family and friends. Polka music brought her great joy. In her later years she became an avid watcher of local football and baseball games on TV. She was also a member of the St. Adalbert’s Rosary Society in Rosholt. Kathleen will be missed for her love of photography and making family photo albums. She was the “go to” person for family phone numbers, addresses, and genealogy questions. She had an impeccable memory for birthdays and anniversaries. Her secret to a happy marriage and life was to journal every night so if an argument arose about a date/event she would say, “I’ll check the book” and that would set a person straight! Kathleen is survived by her husband Dennis Ostrowski,son Michael (Lorie) Ostrowski, daughter Denise (Chris) Moellentine and granddaughter Lorine Moellentine. She is further survived by her brother Mike (Adele Zdebski) Stankowski, sister Mary Lou Janowitsch, sister-in-Law Kay (Dobbe) Stankowski. She also leaves behind many loving nieces and nephews, as well as cousins from both sides of the family. She was preceded in death by her parents Louie and Mary Stankowski, brother-in-law Harry Janowitch and most recently, brother Lloyd Stankowski. Visitation will take place one hour before mass which will be held at 11:00 am at St. Adalbert’s Church, 3305 St. Adalberts Road Rosholt, WI 54473 on Tuesday June 19th 2018. Fr. Jeffery W. Hennes officiating. The family extends their deep gratitude to the wonderful care provided by Thedacare Hospital Appleton staff, and also to the staff at Peabody Manor. Arrangements by Heart of the Valley Crematory. To plant a tree in memory of Kathleen Frances Ostrowski, please visit our Tribute Store. "Email Address" would like to share the life celebration of Kathleen Frances Ostrowski. Click on the "link" to go to share a favorite memory or leave a condolence message for the family.